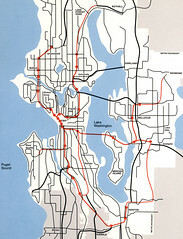 1967 Seattle Transit Plan map image posted by afiler. In 1968, Seattle had a chance to vote in a rapid transit system, as seen in the map here. The Forward Thrust package of propositions contained a variety of civic improvement initiatives, many of which passed (one brought us the late and not-so-lamented Kingdome), but the transit system got only 50.8% Yes votes–and required a supermajority of 60% to pass. In 1970, it was put back in front of the voters, but failed amid “Boeing Bust”-era recession fears. The large amount of federal money ($881 million dollars) secured for the project went instead to Atlanta, where they used it to build the MARTA system. Now we have the chance to vote again to build and expand rapid transit here, and as in 1970, people fear a deepening recession. Will people vote yes, or will it fail and kill transit expansion for another 40 years? I may not live long enough to see a decent rail system here.